Definition: A sampling plan is a term widely used in research studies that provide an outline on the basis of which research is conducted. It tells which category is to be surveyed, what should be the sample size and how the respondents should be chosen out of the population. What should be the Sampling unit i.e. choosing the category of the population to be surveyed is the first and the foremost decision in a sampling plan that initiates the research. e.g. In the case of Banking industry, should the sampling unit consist of current account holders, saving account holders, or both? Should it include male or female account holders? These decisions once made the then sampling frame is designed to give everyone in the target population equal chance of being sampled. 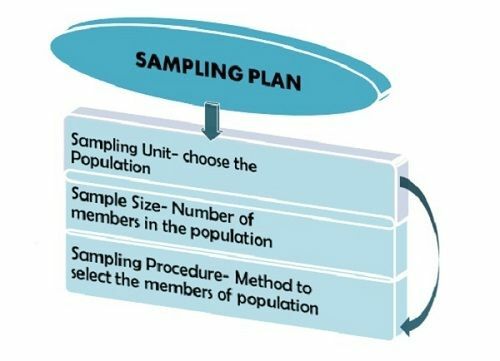 The second decision in sampling plan is determining the size of the sample i.e. how many objects in the sample is to be surveyed. Generally, “the larger the sample size, the more is the reliability” and therefore, researchers try to cover as many samples as possible. The final decision that completes the sampling plan is selecting the sampling procedure i.e. which method can be used such that every object in the population has an equal chance of being selected. Generally, the researchers use the probability sampling to determine the objects to be chosen as these represents the sample more accurately. Simple Random Sample– where every item of the sample has an equal chance of getting selected. Stratified Sample– In this, the population is divided into mutually exclusive groups viz. age group and then the choice is made randomly from each group. Cluster Sample– It is also called area sampling, here the population is divided on the basis of location viz. city and then selected randomly. In case the researcher finds probability samples to be costly and time-consuming then the researcher can make use of non-probability samples which means by choice. Convenience Sample– Here, the researcher selects the easiest and accessible population member. Judgment Sample-Here, the researcher select those members of the population whom he thinks to contribute the accurate information. Quota sample-Here, the researcher interviews the fixed number of members of each category. Thus, a researcher can select any type of sample according to his convenience provided it fulfills the purpose for which the research is conducted.